Black verses White. Good versus evil. Faith versus Science. Man versus Nature. Black Smoke versus Water. The battle continues and escalates and takes a few victims along for the ride in what might be and what isn't; and at this point I'm not willing to concede that anything is real in the world of LOST. 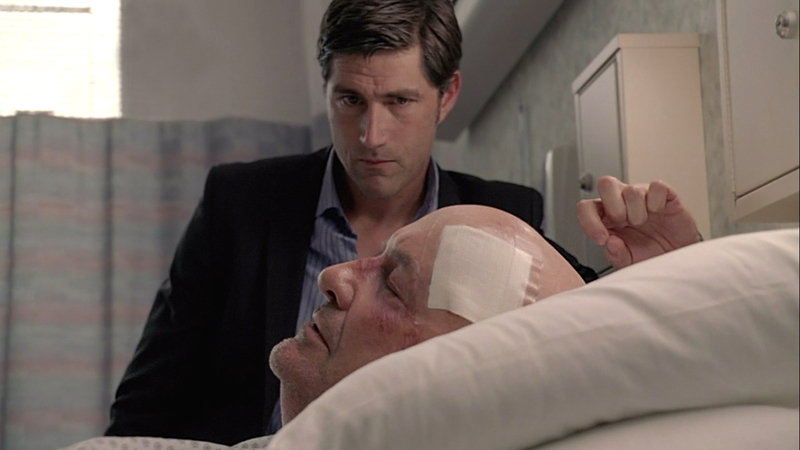 Sideways Jack is obsessed with why John Locke would not opt to heal himself. He also wants to know how John came to be paralyzed. The cages again. Sawyer isn't going to get any special "treats" this time around. Smokie comes around and Jack gets the key and gets them out. Sideways Jack is starting to see evidence of something larger. Way too many people where on flight 815 that he keeps running into to be a "coincidence"; iced when he bumps into Bernard while trying to gather info on how Locke became wheelchaired. Not John Locke convinces Jack to go to the plane (Jack insists he will be staying on the island). Therein NJK "finds" explosives, saying they were planted by Widmore to get everyone in one place, confined, and explode them. Everyone goes to the submarine instead. Kate gets shot. She doesn't die, which is somewhat disappointing. NJK has duped them all and places the explosives in Jack's backpack. Tick-tock, tick-tock. Jack tries the same tractics on Sawyer that he did on Richard "Nothing is going to happen" — but this is Sawyer and no one tells Sawyer what to do. He yanks out the wires on the bomb ... and it ticks down faster. Saywer gets knocked out (of course) and Sun is trapped; pinned against a wall as water fills the chamber. Sayid tells Jack where to find Desmond, and says "It's going to be you" to Jack as he flees. Sayid sacrifices his zombie-self and takes the bomb away. The sub is sinking. Jin won't leave Sun's side as they die together (in what, to me, is the most tradegic moments in LOST ever). That's a hard one to accept. Also, apparently they are no longer "candidates". Sideways John finally explains to Jack that he was the cause of his injury (as well as his father's comatose state) by crashing a plane he was piloting. So this battle is still looming, but there's far fewer players. In fact there might only be a few against 1. At this point it's anyone's guess as to what's happening and why. I'm guessing that Desmond's "constant" status makes him a man who can see all timelines. NJL inability to be allowed to kill anyone (which Jack has figured out) now leaves him with no trust for those surviving, so a clash is inevitable, and he'll have to get someone else to kill everyone for him (Claire?). Will everyone be whisked away to the "party" that Eloise was seen planning for in the sideways world — the one Desmond wasn't prepared to see the guest list for? Who knows. I just hope in the end that these 6 seasons were worthwhile. Comments for "Recap: LOST The Candidate' (S6, E14)"
"Jin won't leave Sun's side as they die together (in what, to me, is the most tragic moments in LOST ever)"
I absolutely agree. Jin's determination to never leave Sun again was his best scene on the series and the final shot of them holding hands as their fingers drifted apart was heartbreaking. But doesn't a candidate have to be on the island? Or are you saying that she was overlooked by NotJohnLocke and she will hold the key for everyone else? I thought Sun was pregnant before she got to the island (the whole affair thing and not knowing who the father was, etc). Maybe I'm wrong. She was technically on the island. But if we go that route, what about Aaron? Aaron was on the island, is a Littleton (is that a candidate anymore or crossed off?) and isn't presently on the island. The reunion of Jin and Sun last week was pathetic (How long have we been waiting for this!?)... Their death together this week was beautifully tragic. Comments are turned off for "Recap: LOST The Candidate' (S6, E14)"